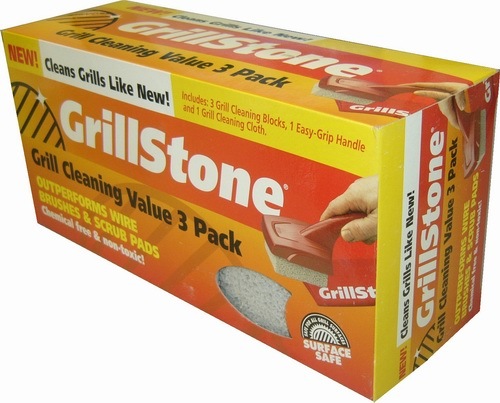 GrillStone Club 3 Pack Contains 3 Grillstone BBQ Cleaning Blocks, convenient handle and cleaning cloth. Grillstone® is a non-toxic, heavy-duty cleaner for coated and metal grills GRILLSTONE Food safety is important when it comes to grilling. The first step to avoiding unhealthy bacteria is by having a clean grill. GrillStone is the easiest way to quickly and safely remove burnt on food and grease from outdoor or indoor grills and griddles. GrillStone reaches all surfaces by conforming to the shape of the grill. Additionally, GrillStone can be used while the grill is still warm, before food hardens. GrillStone's unique consistency works four times faster (4x) and lasts longer than wire brushes and scrub pads, reducing cleanup time. Made from over 90 percent recycled material, the chemical-free and non-toxic GrillStone is safe around children, pets and food. It is lightweight, compact and durable, and can be easily packed for camping and picnics. Recommended use: GrillStone can be used on all home, gas or charcoal barbeques, grills and griddles. Removes grime, cooking buildup, rust and corrosion from all surfaces including backed enamel, cast metal and stainless steel. DO NOT USE on “Non-Stick” type coatings.